For healthy joints, cartilage and connective tissues. The main component of ligaments, tendons, cartilages and spinal discs is collagen, which is the most abundant protein in mammals. Its purpose is to actually connect cells together. The name collagen is derived from Greek and means to produce glue. The tissues mentioned above are also rich in proteoglycans, which are composed of 95% glycosaminoglycans (GAGs) and 5% protein. These GAGs act as a framework for collagen to model onto and consequently are responsible, with collagen, for continuously rebuilding ligaments, tendons, cartilages and spinal discs. The major precursor in GAG production is Glucosamine, which is produced in the body from glucose and glutamine. Athletic endeavour, physical work or simply passing years means the body can no longer keep up with demand for Glucosamine and damage to the joints can occur. Joints - supplementation with Glucosamine has been associated with slowing down the rate of wear of cartilage, the stimulation of synovial fluid production and, in some cases, restoration of the thickness of cartilage in the joints. Glucosamine has also helped a number of other joint related problems resulting from operations, injuries and slipped discs. Eyes - Glucosamine has helped in the condition Uveitis, which is an inflammatory disease of the iris and focusing muscle. It is also helpful in preventing changes in the Vitreous Humour (the clear jelly within the eye) and thus protects the retina from release. 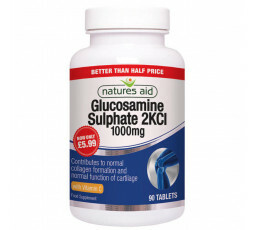 Glucosamine is an essential precursor to the glycosaminoglycans Chondroitin sulphate (a key structural component of cartilage), Hyaluronic acid (found in synovial fluid, the Vitreous Humour in the eye and loose connective tissue) and Aggrecan (which gives connective tissue elasticity). Glucosamine is a readily absorbed amino sugar which quickly enters the bloodstream. 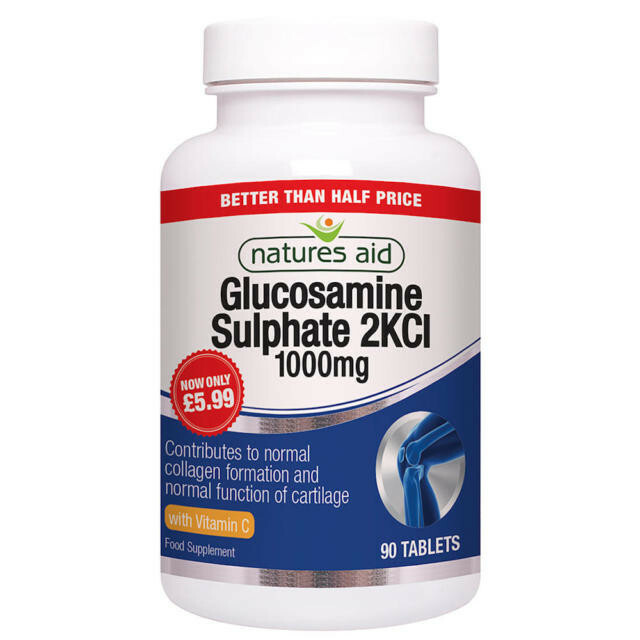 Anyone who needs to monitor blood sugar levels should be made aware of this, though three extensive, recent trials have reported stable blood sugar levels in subjects taking Glucosamine in its sulphate form. People with a known shellfish allergy should avoid the Glucosamine Sulphate form as it is derived from shellfish. Sodium free and Bovine free.